3 Bedroom Detached House For Sale in Sheffield for Guide Price £225,000. 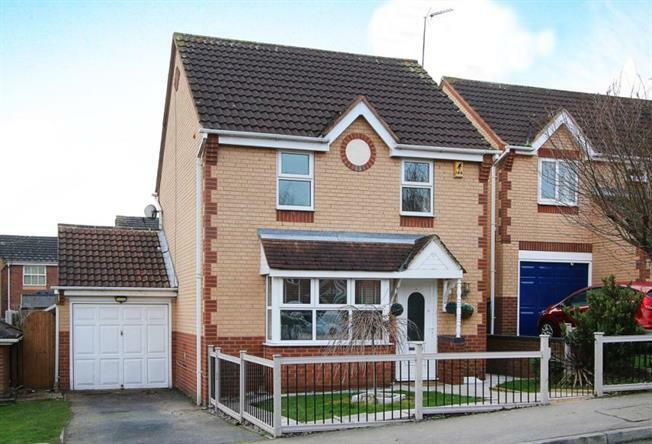 A deceptively spacious & attractively presented, extended THREE bedroom detached family home. The generously proportioned accommodation has been reconfigured and finished to a high specification providing a contemporary light and airy feel throughout the ground floor, boasting a fabulous bay fronted fitted kitchen open plan to a dining room, utility room and larger than average lounge over looking and accessing the rear garden. A master bedroom provides en suite facility, two further bedrooms and family bathroom and the garage is currently used as a occasional snug room with mezzanine level. The accommodation in brief comprises: entrance hallway with laminate to the floor, stairs rising to the first floor landing, ground floor wc and a door leads into the bay fronted breakfast kitchen which has a range of attractive white high gloss wall and base units with concealed lighting, tiled splash backs and plinths, breakfast bar area and integrated appliances to include multi fuel double oven and an extractor fan. Laminate floor flows through open plan to the dining room which leads on to a rear facing lounge with French style doors accessing the rear garden. Along with a door from the dining room into a utility room which benefits from a single base unit, space and plumbing for an automatic washing machine and double fridge freezer, as well as housing the gas heating boiler. First floor landing: master bedroom with a range of built in mirrored wardrobes and access to an en suite shower room, double bedroom two with spot lighting and loft access, single bedroom three and family bathroom fitted with an attractive contemporary three piece suite in white comprising wash hand basin, low flush wc and bath. LED coloured mood lighting, tiling to the walls, floor and ladder towel radiator. Outside: to the front of the property is an gated enclosed low maintenance forecourt, side driveway providing off road parking for two vehicles, whilst to the rear of the property is a fenced and enclosed well maintained rear garden with decked terrace, sauna and Jacuzzi. Access via French style doors from the rear garden leads into the occasional snug room/garage, with mezzanine level and two rear facing sky lights.